Everything arrived very well in Wendlingen at Friday morning. Thank you very much. By the way, now I am proud to be the owner of two dowelmax classic sets. I have parkinson and my fingers sometimes have difficulties to change the setting of the tool. But now, it‘s no need to change the settings of the dowelmax, what a comfortable progress. I am sure you heard it often but not from me: To me, the dowelmax is a exellent and accurate working tool, produced in high quality and really easy to use. In combination with the check-mark system this tool allows me to realize my woodworker-dreams fast, accurate and with a lot of pleasure. With respect and sending big compliments to the creator of this perfect tool. Just wanted to say thank you again for such a wonderful product. 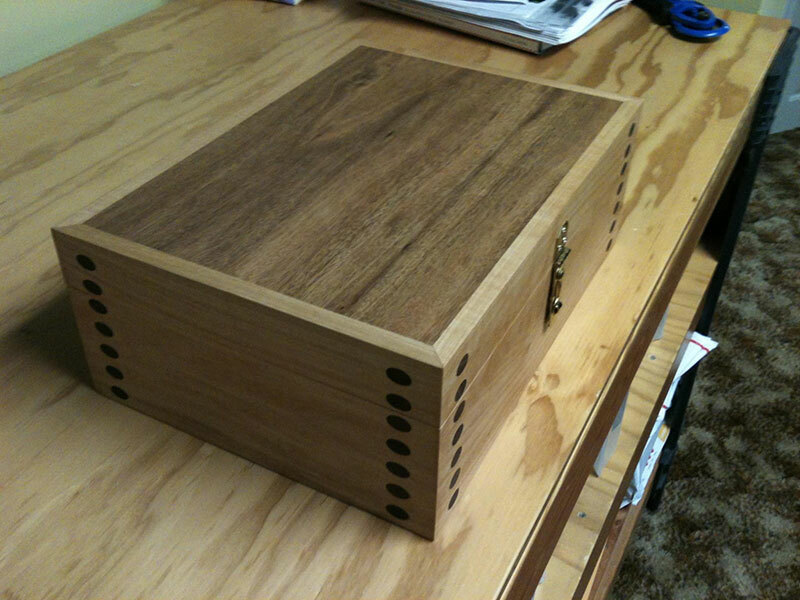 I have sent you my pictures before of the box that I made out of Cherry wood to carry all of my Dowelmax products in one cool box. This time I would like to show you how Dowelmax turned a 2 week project into a 2-1/2 day project using the 8 mm system with the standard offset of ninety degrees and the optional 45 degree plate. 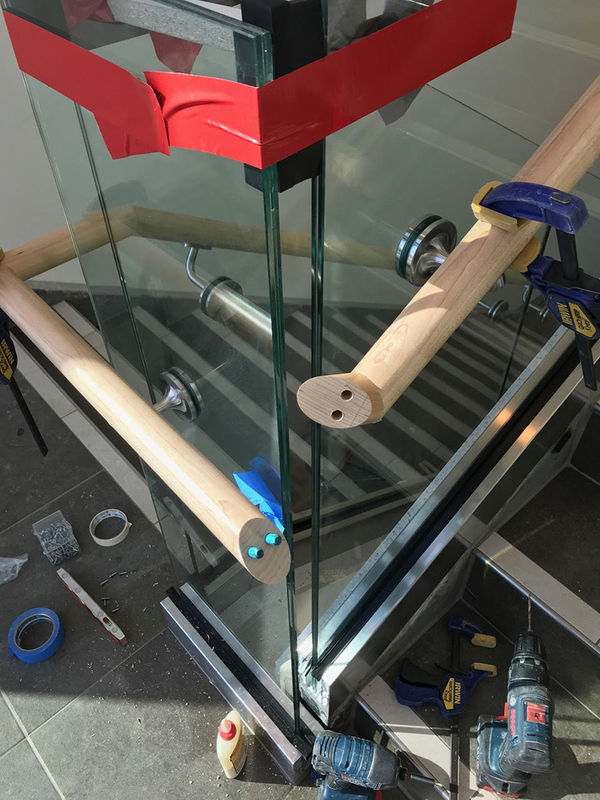 I needed to install some round 1-1/2” maple hand railing onto glass vertical risers while helping to stabilize the glass with the railing including the corner sections and between each panel on three flights of stairs. Using my brain and a little patience, I came up with a way of keeping all the joints perfect with two dowels in each joint. Here are some of the pictures. As you can see I made easy work of 15, 30, 90 and 45 degree joints by clamping the jig to my table and lining up the railing into the jig flat on the face indexing every joint perfectly. Some of the joints where even done off the table being hand held on the railing while on the stair. 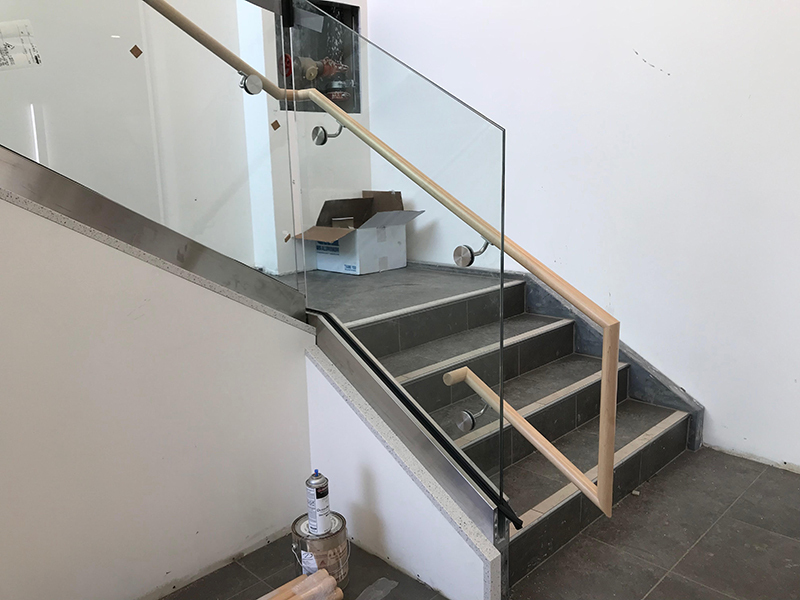 The strength of all the joints is very impressive and there are literally no fastener marks of any kind on this pre-finished railing. Thank you again for such an amazing product and excellent craftsmanship in the product. I just wanted to let you know how much I enjoy using your doweling jig. I’m a hobbyist woodworker, and I purchased the 3/8 classic a couple of months ago, specifically for building cabinets using Melamine. I have previously assembled the cases using a number of techniques: biscuits, Confirmat screws, and milling dados and rabbets. No technique that I have used before comes close to the accuracy of your jig for perfectly aligned, strong, tight fitting joints. I’m able to dry assemble my cases to test for fit, and they stay in place perfectly without glue, using only half the dowels for the test fit. There are no screw heads to cover with ugly caps, and the look is cleaner than rabbets…and I’m sure stronger. And after doing some research on the strength of biscuits, or lack thereof, I’m not sure I’ll use my biscuit joiner again. I’m sure your engineering background has a lot to do with how precise the jig, and resulting dowel holes are. Using the referencing pin to span the length of the cabinet pieces works perfectly. My next project is a rolling kitchen cart with a butcher block top. I’ve decided that instead of using mortise and tenon joints like I have done in the past, I’m using your jig for all the joints in the frame. I have no doubt it will save me a lot of time and produce a great result. It’s nice to support a small company like yours that makes great products. The other option that I had was Festool’s Domino. 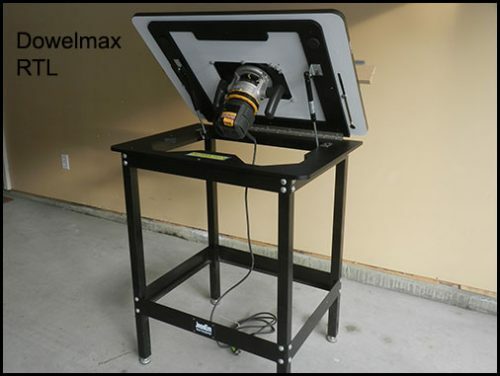 You might think that the price range of Dowelmax is not comparable with Festool’s Domino. Well, actually in my case it is. You see I live in Greece so my parcel had some custom fees and the total amount I ve paid(buy+shipping+custom fees) is $680.00! Just want to let you know that this is one really nice tool. The quality is just outstanding. I have bought to many tools that don't work as advertised. This is not one of them. This is going to bring the quality of my work up to where I want it. Thank you for building such a nice tool that works as it is supposed to. I will tell all of my woodworking friends about it. Thanks, Scott M.
Thank you very much for sending the replacement 1/4” drill guides. Although I needed only two replacements you sent three and a base block as well! Clearly, the new base confirms that these replacement guides fit as designed, although I’m pretty sure that the original block was correctly machined. In a way, it’s rather sad that your company’s concern for its customers is unusual enough that I will tell the owner about this experience. All of our vendors should show this level of concern. I will recommend that he put one on display in each of his stores. We should have done that a long time ago. It’s a great product - a real alternative to the prohibitively expensive Domino, a precision and more flexible version of other doweling jigs, and a much stronger and less intrusive alternative to the Kreg pocket hole jig (although that product does have its place). It was nice talking with you this afternoon about my new dowelmax. I want to thank you for your speedy response to my order, and let you know that I believe it is one of the best values of any purchase I have ever made for my shop. It is incredibly well made, very complete, and perfectly accurate. I made a little hall table for my wife this afternoon as a learning exercise. It is a simple table, but the idea is that what would have been 24 mortise and tenon joints requiring a day or so to cut was finished in about 5 hours from wood pile to table including sanding, sizing, cutting and joining. I did some things in the construction that I would not ordinarily do in order to check the jig for accuracy and precision; I re-drilled three of the members for longer dowels after I had removed them from the jig and moved on with the project. The 18 holes that were re-drilled to double their original depth were in no way sloppy or misaligned. I made this table after reading the general guidelines for using the jig and only one page of instructions. The use of the jig is straightforward and intuitive so that even an offset situation like the table skirt is simple. I have seen some discussions lately regarding the price of the jig to which I can only reply, "Give the man the money!" I thought that I would not discover a new essential woodworking tool now that I am in my 70's, but if one has doweling applications, this is an essential purchase. Thanks again for an exceptionally well engineered product, and for your courteous and friendly help with my purchase. A few years ago I purchased a Dowelmax jig. I would like to offer my experience with it, and some examples of the joint strength I achieved. Initially, I didn't use it for much, but lately I have used it for several projects. I have also made and deliberately broken some joints just to see for myself how strong dowel joints can be. I have tried doweling in the past with homemade jigs and another brand of store bought jig, both with disappointing results. I am however, very impressed by the fit and finish of the Dowelmax and the accuracy of it. I have found it easy to use and extremely accurate. I just completed two chairs; one in oak and one in cherry. I used 3/8" dowels in the front and back rails, and 1/4" dowels in the vertical slats. All of the 3/8" holes were made using the Dowelmax, and everything went together securely and accurately. I used a different brand of jig for the 1/4" holes, since I don't have the 1/4" accessories for the Dowelmax. The other jig worked, but not without some frustration and misalignment. Nevertheless, the chairs were completed and turned out to be fairly nice. I have done a lot of reading about joinery and have seen both praises and criticisms of dowel joinery. To satisfy my own curiosity, I made and broke several joints. The joints were made with 3/8" dowels, most of the test pieces were maple (one was oak and one was cherry simply because they were on hand), and I used Elmer's Glue-All, Titebond 2, and Titbond 3. In two of the pieces I tried applying glue only in the holes before assembly. This resulted in a decent joint, but I was able to break it fairly easily. In the other joints I applied glue to the holes and the dowels themselves before assembly. This joint was significantly stronger, so strong that when I broke them the dowels held and broke out the surrounding wood. I have attached photos of the chairs and the broken joints. I just wanted to share with you the box I made to store my Dowelmax jig and accessories. 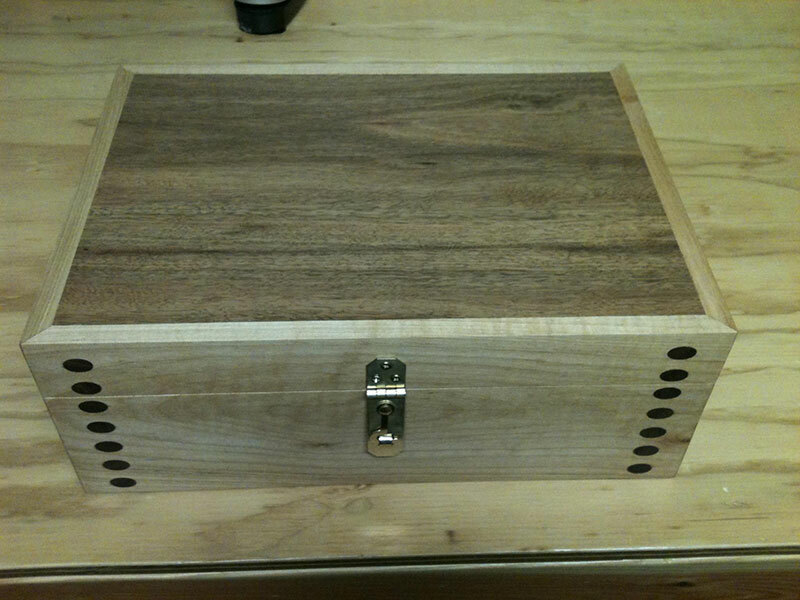 The box and dividers are soft maple while the dowels and lid are black walnut. I used 3/8 dowels on the miters and 1/4 dowels for joining the dividers. I ended up using nearly every accessory in the making of the box. 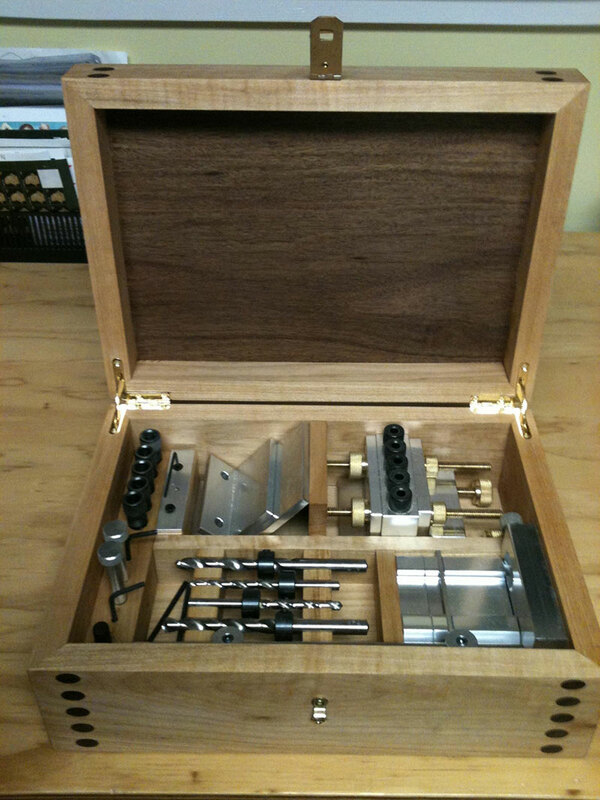 I believe such a classy tool deserves a classy box to keep it in. Please feel free to share if you would like. Jim, All I can say about the build quality is WOW! It's obvious one gets what one pays for with the Dowelmax, and that's precision and quality. On my first test, after reading the enclosed information, everything came out perfect. Frankly, I'm not very good at woodworking, but I do so enjoy it, the Dowelmax has made joinery a process now vs an obstacle for me to overcome. 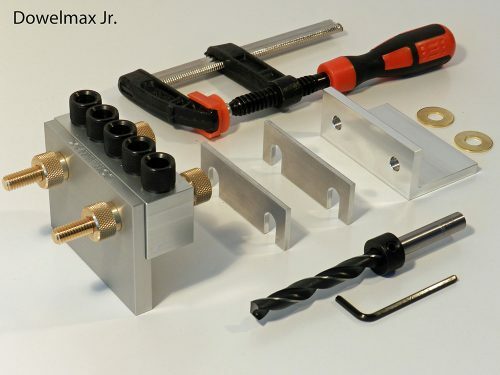 In fact, I plan to use dowel joinery for most every project so I have ordered the 1/4 inch setup and a few other accessories, I would highly recommend the Dowelmax to any woodworker. Thanks for making such a high quality precision product. 25-04 yesterday, I have received the Dowelmax well and I have the honor and pleasure to congratulate you for the fine workmanship, easy and job accuracy of this unit. Definitely worth the expenditure. I have just made up three test joints, as I mentioned in my email yesterday, all in 4” x 2” CLS – a face T joint, a mitre joint and a normal corner joint, all with 5No. 10mm dowels. This exercise was also a training exercise for me in the use of the system. It worked absolutely brilliantly, if anything it showed up the inadequacy of my mitre saw to cut squarely. May I compliment you and your team for the production of a system which is not only accurate, precise and very well made, it is a complete joy to use – very tactile! Just wanted to let you'll know, I purchased the DowelMax and used it for the first time on the following table. I did quit a bit of research on what would be the best joint for all the curved connections and I decided to go with the DowelMax. I was Very nice pleased with the Jig and would recommend it to anybody that want a quick dead on joint. Below are some pictures of the Mesquite Dining Table and a video on YouTube of the table being made. Just this past Friday, Jan. 2, I received my order of several bags of dowels and two new drill bits. I was really anxious to try the drill bits because you had told me that they were better than the original bits that I got with the Dowelmax jig which was purchased about three years ago. 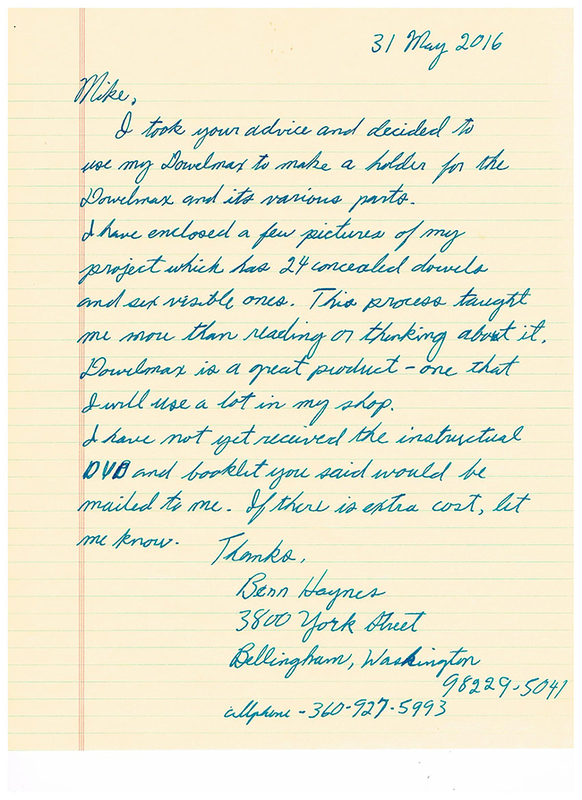 It isn't often that I write a review or contact a company about their product, but because of your exceedingly superior quality tool, the Dowelmax Jig and your personal customer service I feel compelled to write this letter to you. I have been a cabinet and furniture maker for about 45 years now. As you can imagine, in that period of time I have owned and tried many different tools. In choosing my tools I have always insisted on top quality being the first consideration, then price. 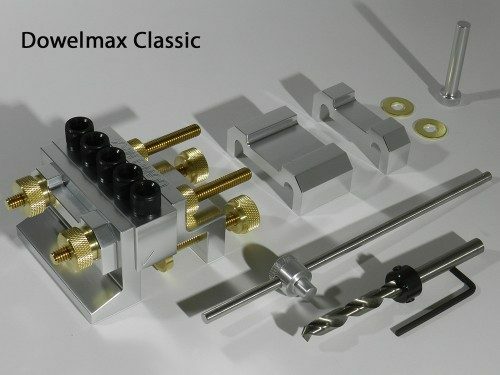 Your Dowelmax Jig exceeds all of my expectations relative to quality and the price is more than fair for what we get. 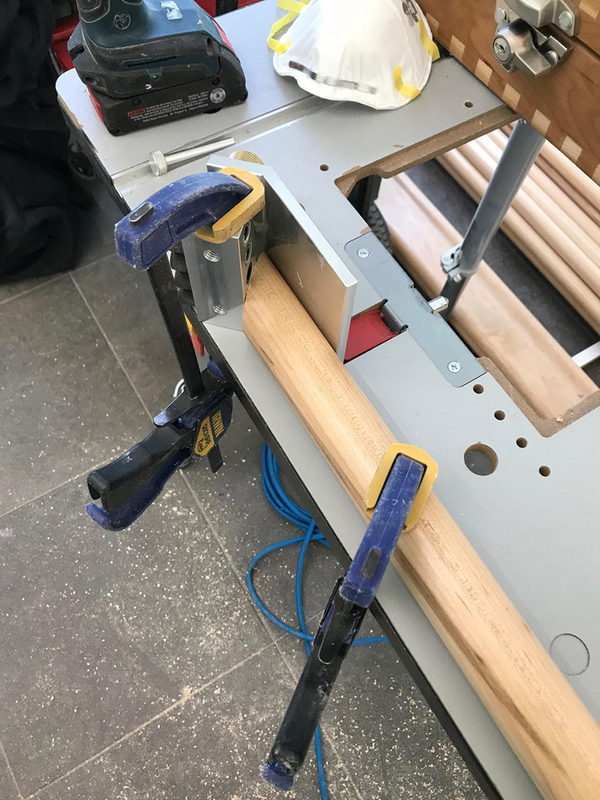 The Dowelmax Jig has made it possible for me to build a better quality piece of furniture, such as tables and sets of chairs as opposed to using the mortise and tenon joint. The way you have designed the five pin jig, offers a more accurate and stronger joint while taking much less time. Just this weekend I used the new drill bit and drilled about 100 holes. This bit is absolutely the best I have ever used. Drilling into the end grain of Red Oak most of the time offers a lot of resistance, but with this bit, it was almost like drilling into a soft piece of pine. Thank you for informing me about this tool. Another great feature is that the flute of the bit does an excellent job of lifting the drill shavings and expelling them from the hole. I found that the bit doesn't get extremely hot like my previous bits have done and even after drilling about 100 holes the bit isn't showing any signs of dulling. I never thought I could ever get so excited over a drill bit. As a business man who has owned and managed four businesses over the past 45 years I have a great appreciation for quality customer service. I have always believed the business owner should have direct contact with their customer, because this is what most consumers are more comfortable with and the business person should be getting direct input from their clientele, because after all, they are the life blood of any business. My preference is to deal with family run small businesses such as yours. I couldn't be more pleased with your product and your follow up customer service. Another reason that a quality product and excellent customer service is very important to me, you may find quite surprising, I am totally blind. Many people find it hard to believe that I do what I do without seeing, but I do my work and it isn't really that hard especially when I have top quality tools to work with. I'm sending along a few pictures of some of the jobs that I have done thanks to the assistance of the Dowelmax Jig. Once again, thanks to you and your family members that I have talked with who have made my work easier by offering to me good advice about getting the most out of the use of your Dowelmax Jig. It has been a great pleasure doing business with you.